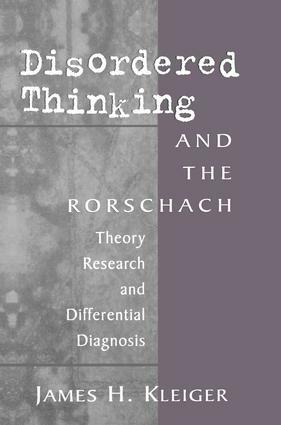 In Disordered Thinking and the Rorschach, James Kleiger provides a thoroughly up-to-date text that covers the entire range of clinical and diagnostic issues associated with the phenomenon of disordered thinking as revealed on the Rorschach. Kleiger guides the reader through the history of psychiatric and psychoanalytic conceptualizations of the nature and significance of different kinds of disordered thinking and their relevance to understanding personality structure and differential diagnosis. He then moves on to thorough reviews of the respective contributions of David Rapaport, Robert Holt, Philip Holzman, and John Exner in conceptualizing and scoring disordered thinking on the Rorschach. These synopses are followed by an equally fascinating examination of less well known research conceptualizations, which, taken together, help clarify the basic interpretive conundrums besetting the major systems. Finally, having brought the reader to a full understanding of systematic exploration to date, Kleiger enters into a detailed analysis of the phenomenological and psychodynamic aspects of disordered thinking per se. Even experienced clinicians will find themselves challenged to reconceptualize such familiar categories as confabulatory or combinative thinking in a manner that leads not only to new diagnostic precision, but also to a richer understanding of the varieties of thought disturbances with their equally variable therapeutic and prognostic implications. With Disordered Thinking and the Rorschach, Kleiger has succeeded in summarizing a wealth of experience pertaining to the rigorous empirical detection and classification of disordered thinking. Equally impressive, he has taken full advantage of the Rorschach as an assessment instrument able to capture the richness of personality and thus capable of providing a unique clinical window into those crucially important differences in the quality of thought that patients may evince. "Psychiatric disorders, however defined, affect thought organization. Indeed, the most severe of these conditions, the schizophrenias and the major affective disorders, can be recognized by tell-tale ways in which thinking is derailed and disorganized. The most powerful clues to differential diagnosis of psychoses, we have learned, lie in the nature of thought organization. Clinicians and researchers will treasure James Kleiger's thorough and dispassionately critical survey, which will provide them with a strategic perspective on diagnostic issues in this vitally important domain. Disordered Thinking and the Rorschach is a valuable and much-needed resource for clinical and research inquiries." "James Kleiger has produced a superb piece of scholarship that extends from thorough coverage of theory and research to useful guidelines for clinical practice. This clearly written and extensively referenced book provides a storehouse of information concerning the nature of disordered thinking, its manifestations in Rorschach responses, and the possible diagnostic implications of a thought-disordered Rorschach protocol. Rorschach researcher and practitioners alike will read it with pleasure and profit." 17. Creativity of Disordered Thinking? Certified by the American Board of Professional Psychology in Clinical Psychology, James H. Kleiger, Psy.D., is Director of Postdoctoral Psychology Training at the Menninger Clinic and a Fellow of the Society for Personality Assessment. Dr. Kleiger is also a senior candidate and teaching associate at the Topeka Institute for Psychoanalysis.